The prothesis ,(laying out) took place the day after a death in the house. It lasted the whole day, and this was when the traditional laments were sung and the relatives and friends of the deceased said farewell for the last time. Bandaged in a linen wrapper (the endyma), the corpse was placed on a bier - a high trestle with a thick mattress covered with epiblemata. The head of the deceased was raised on a head-rest. It was the women of the family who were in charge of preparing the corpse for its laying out. They washed it, rubbed it with olive-oil, dressed it, and decorated it with flowers, wreaths and jewelry. 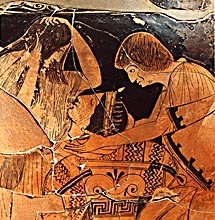 Prothesis is frequently depicted on Attic pots. On the third day, before sunrise, the ekphora the 'carrying out' of the corpse took place. This was when the deceased was transferred from the house to the grave. It involved a procession that, by law, had to go noiselessly through the streets of the city. When the procession arrived at the graveside, the corpse was placed in the grave. It had been a tradition from the time of Kekrops (so Cicero tells us) to plant seeds in the soil of the grave mound - thus ensuring that the dead person would rest in peace and that the earth would be purified. Other ancient writers further tell us that liquid libations (choai) were poured onto the grave, and this is confirmed by the number of kylikes and other vessels found beside or on top of tombs. We also know that there was a ceremony called 'the third day rites' (trita) which took place at the grave two days after the death. After the corpse had been buried, the mourners returned to the dead person's house. Outside the house there now stood a pot. This was a sign that there had been a death and that the household was contaminated by a pollution (miasma). This pot contained water - brought from elsewhere - with which the mourners cleansed themselves as they took their leave. The ekphora is a frequently represented on Attic pots. The perideipnon was the funeral banquet which took place at the home of the deceased. It enabled the relatives to come together and talk about him or her. Cleansing the house is also referred to, as are restrictions on the number of people permitted to enter it. From the archaeological finds on top of graves - such as ashes, animal bones, potsherds from drinking vessels, pinakia and lekanides - it used to be thought that the perideipnon was held at the graveside. But comparison with literary evidence makes it seem more probable that the meal took place in the house, and that the charred substances and the smashed pots on the tomb should be interpreted as remains of food-offerings to the dead. Eight days after the burial, the relatives and friends gathered at the tomb to perform the 'ninth day rites' (ennata). The only information we have about these rites is that they were often cited in legal cases. The end of mourning was signalled by a ritual; it is not known exactly when it took place. According to the ancient writers, after this ritual, the household resumed normal life, having performed their 'duties of custom' (nomizomena) to the deceased. Even after the period of mourning had finished, the family still had obligations to the dead. The rituals that followed a death were often the occasion for an adoption, thereby enabling a parent without an heir to ensure that the rituals were properly performed. This shows how important they were. A fair number of these anniversary rites are mentioned in passing by some ancient authors. They had names like Genesia (anniversary), Nemesia (rites for the god Nemesis), Nekysia (corpse rites), Epitaphia (rites at the tomb), Horaia (rites of the Hours), Apophrades (impure days), Miarai Hemerai (days of the curse), Anthesteria (spring-flower rites), and Eniausia (anniversaries). They probably involved a visit to the tomb (during which offerings of flowers, wreaths or fillets were made) and a domestic gathering. Plato also mentions a law concerning ancestral heirlooms. It is not clear what these heirlooms were exactly, but they were not to be removed from the house or destroyed.